Benriachs from the 1970s have a very strong reputation among many whisky geeks. 1976 is the “vintage” that is claimed to be the magical one (see again my annoying opinions on this subject here and here) but by and large all 1970s Benriachs are expected to be good. The distillery under the ownership of the Walkers (who recently sold it and Glendronach and Glenglassaugh to Brown-Forman) built its latter-day reputation on a program of annual single cask releases (as they did with Glendronach). Oddly, while they seem to have fudged the re-racking and de facto finishing that probably went on with a number of the Glendronach releases, in the case of Benriach they noted clearly when casks had been finished in sherry or port or whatever. This particular cask was finished in PX sherry, which is the sort of thing that makes you wonder: why does an older bourbon cask whisky need to go into a PX cask? Here is the second of two reviews of K&L exclusives. I did not enjoy last week’s Faultline Blended Scotch Whisky at all. 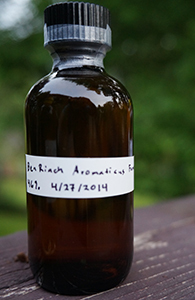 Will this Benriach, which is much older, be better? It won’t take much. 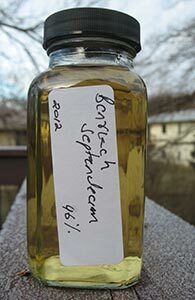 This is from a bourbon barrel and made from peated malt (Benriach is one of the few Speyside distilleries that regularly issues peated whisky—see also my reviews of their Curiositas, Septendecim, Arumaticus Fumosus and Solstice). K&L originally attempted to sell it for $150 but after a while were forced to lower the price to $109, at which point it eventually sold out. Good to see sanity prevailing every once in a while among customers in our overheated market. 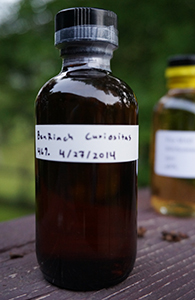 I mentioned the silly Latin names of BenRiach’s peated whiskies in my review of the Curiositas yesterday. Well, as silly names go, Arumaticus Fumosous is hard to top (at least, so I thought till I remembered the name of their peated port finish in this series: the Importanticus Fumosus). This is a 12 yo finished in Jamaican dark rum barrels. I’m not sure if this is the Curiositas + 2 years in rum casks or some other formulation. I do hope I’ll like it better. Let’s get right to it. One of the younger entries in Benriach’s series of peated whiskies with silly Latin names, the Curiositas is one I’ve had my eye on for a long time but never been able to bring myself to buy. Thanks to a sample trade I finally get to check it out. This is a 10 yo from bourbon casks (I believe). I was not overly enamoured of its older sibling, the Septendecim but I did quite like the Solstice 2nd. Ed.. Let’s see what this one is like. 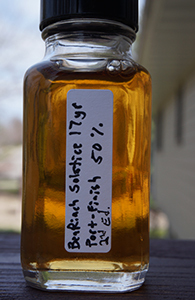 Benriach 17, “Solstice”, 2nd Ed. In my review of the Cadenhead’s Tamdhu from port casks I noted that I generally prefer peated port cask whisky. And here now is a peated port cask whisky, albeit only a finish, this one an official release from Benriach. I was not terribly impressed by the last peated Benriach I had, coincidentally also a 17 yo as this one is, but not from port casks (the Septendecim); I hope this one will be better. Benriach, a Speyside distillery, known mostly for a fruity, unpeated malt also has made a good amount of peated malt over the years, much of which has been released in single cask form in the last few years. Some of these have been very well-received, and usually they seem to be matured or finished in sherry/port/etc. casks. The peated whisky in their regular line is mostly ex-bourbon (I believe) and they bear odd Latin names such as “Curiositas” and “Authenticus” and so forth. Hence perhaps the name of this 17 yo which is also peated and was quite a hit when it came out almost two years ago. I finished my bottle almost exactly a year ago but, as is my wont, saved a 6 oz reference sample from when the bottle was at its prime.